Check out the very best in photography, lighting and Photoshop-related technology, gear and services at our biggest show floor yet! Along with exciting bonus classes, product demos and live photo shoots, youâ€™ll be able to take advantage of exclusive bargains and discounts from the key players in the market. 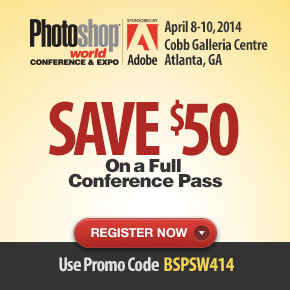 Photoshop World is where creative people from all walks of life come to take part in affordable, hands-on learning that canâ€™t be found anywhere else. In-depth workshops provide a deep-dive into the topics you want to learn most. More than 100 training sessions with seven different learning tracks are designed to make you more effective, more productive and more creative than ever. Learning is made fun during three incredible days of hands-on training from the industryâ€™s top instructors in photography, lighting and graphic design. Like every great journey, the mastering lighting begins with a single step. This seminar will look at ways to learn to see and sculpt light a single light source. Photographer Brian Smith will breaks lighting down into something you can understand in a straight-forward nuts and bolts workshop of practical concepts to squeeze all the mojo out of a single light source. Learn how to shoot compelling portraits even in harsh or unflattering light by harnessing the power of a single light source. Great environmental portraits capture both personality and place. Pulitzer Prize winning, Miami-based Photographer Brian Smith photographs noteworthy and notorious celebrities in the locations where they live, work and play. He will show how he photographs subjects on location so that the environment adds another dimension to the shoot showing examples of how he approaches shooting on location whether itâ€™s a large production shoot of a famous subject or simply the someone he met on the street while traveling.